A fisherman from the Boulogne sur Mer based trawler "La Fregate" stands next to the fishtank, off the coast of northern France, August 30, 2017. NEWLYN, England/PARIS - For the fishermen of this small port on the toe of England, Britain’s vote to leave the European Union was an answer to their prayers. After 45 years chafing under what they saw as unfair quotas in one of the world’s richest fishing grounds, the UK government would finally, in the lexicon of Brexiteers, “take back control” of British waters. But what Brexit gives with one hand, it can also take away. European fishermen want Brussels to use its trump card - continued access to the essential EU market - in negotiations on how to divvy up the seas. It’s a familiar issue for negotiators hashing out the terms of Britain’s exit due in March 2019. The talks are currently focused on separation but will move to the future relationship, including trade ties, later this year. “From our point of view, if they get free access to the European market, we should also have free access to fish in the British fishing zone,” said Niels Wichmann, head of the Danish Fishermen’s Association. Trade access is vital to Britain because it exports the bulk of the seafood it catches while importing the majority of what it consumes, mostly cod, salmon, tuna, haddock and prawns. Europe imports about 75 percent of the British catch, a cornucopia of 40 species that is too exotic for most domestic consumers, such as the cuttlefish and megrim sole sold every morning at Newlyn’s market in Cornwall. “Previous generations were comfortable and knowledgeable in buying, preparing and cooking seafood, but the current generation of seafood consumers see seafood as a scary protein and tend stick to the same top 5 favorites,” said Richard Watson, analyst at UK seafood industry group Seafish. Cod was the most popular fish in the year to June 16, 2016, at 69,321 tonnes, out of total seafood consumption of 485,691 tonne, according to Seafish data. The group estimates around 90 percent of the cod supply was imported from countries such as Iceland and Norway in 2014, a number not likely to change substantially no matter what terms are agreed on Brexit, especially as the oceans warm up. The UK has been heavily reliant on imports of the species since losing access to the richest fishing grounds in the north Atlantic decades ago after the so-called Cod Wars. Much of the salmon consumed in Britain is farmed in steel cages off the coasts of Scotland, Norway or Iceland, while tuna are generally caught in the Indian Ocean and imported. Britain has said it plans to allow foreign ships to fish in UK waters after Brexit but claims the right to decide the extent of access. The EU will be seeking to maintain something close to the status quo, industry sources say. Any restrictions on EU market access would likely take the form of tariffs, which can be as high as 24 percent on seafood. For European fishermen, losing rights to British waters would have devastating consequences. Sean O‘Donoghue, CEO of Ireland’s largest fishermen’s representative body, Killybegs Fishermen’s Organisation, said it would be “game over for us”. Killybegs said about 60 percent of mackerel and 40 percent of Dublin Bay prawns, which together make up about 60 percent of the value of all Irish fish landed in Irish ports, are sourced from UK waters. About a third of the output of France’s northern departments of Normandy, Brittany and Hauts-de-France comes from UK waters. “Brexit would mean a big loss in revenue for everyone ... The places where we can fish are already limited,” said Jean-Charles Frammery, captain of French boat La Fregate. Revenue for French fishermen would drop by 50 percent and wages by 15 percent if the UK closed its waters, said Hubert Carré, director general at French fishermen’s group CNPMEM. Belgian fishermen get around half their catch from UK waters. “We could go to other parts of the North Sea but it would not be able to fully compensate,” said Sander Meyns, project coordinator at Rederscentrale, the organization representing Belgium’s fishing industry. Spain gets around the problem by having a Spanish-owned but British-flagged fleet, a legacy of the years before Spain joined the EU, when it invested in Britain to gain access to the bloc’s fishing quotas, the Spanish Confederation of Fisheries (Cepesca) said. The quota system is one of the biggest sources of frustration for British fishermen, who were among the most vocal supporters of the June 2016 vote to leave the EU. For the last 34 years, the Common Fisheries Policy quota has given 84 percent of the cod in the English Channel to France and just 9 percent to Britain, for example, according to Britain’s National Federation of Fishermen’s Organisations (NFFO). 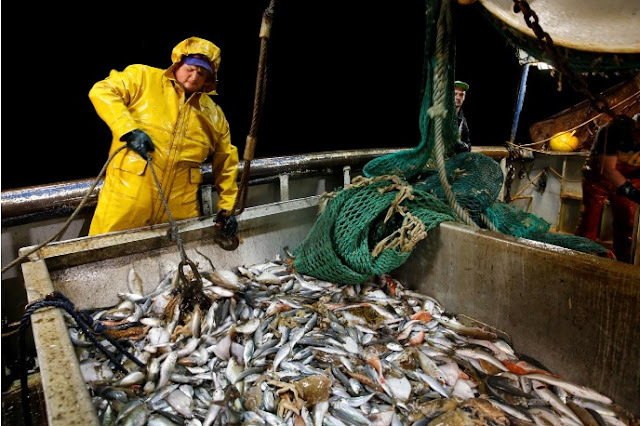 “Given the EU fleets take about four times as much fish out of UK waters as we take out of EU waters...the expectation is there will be a lot more fish (for UK fisherman),” said NFFO chief executive Barrie Deas. Barnier, the lead negotiator for the European Union, is a former French agriculture and fisheries minister. Representing UK interests is the senior government minister in charge of fishing, Michael Gove, the son of a fish merchant. So far, neither side has stated a position and there has been no mention of fish in the official negotiating documents. The EU says failure to reach agreements with London will hurt the British economy more than that of the EU. The fishing lobby’s clout may have been strengthened by the outcome of this year’s parliamentary election in Britain -- the ruling Conservatives were able to cling to power after losing seats overall because they gained ground in the important fishing region of north-east Scotland. Some experts believe it may not be the end of the world if Britain loses unrestricted access to Europe. British consumers are already becoming more adventurous about the varieties of fish they eat and this could accelerate that trend, said Craig McAngus, a politics lecturer at the University of Aberdeen. “Clearly it could be cheaper to eat fish that has been caught in the UK than imported from wherever else. I think the market in fish will change,” said McAngus, who is researching UK fisheries post-Brexit. David Stevens, who skippers the “Crystal Sea” boat at Newlyn, saw scope for sales outside the EU. “If they (the EU) decide not to buy British fish, that opens up the rest of the world. That is a very big market,” he told Reuters while repairing his nets. The mood in Newlyn was positive, Stevens said. But he added some were waiting for the results of the EU talks before making investments. “I think fishermen would definitely be looking to invest in boats, modernize them, and get them ready for a post-Brexit future,” he said. For the fishermen of this small port on the toe of England, Britain’s vote to leave the European Union was an answer to their prayers.